1 cup of Chula Brand Pineapple chunks. 1 cup of whole strawberries. Time: 5 minutes for 2 servings. This recipie is no rocket science, after gathering all the ingredients and slicing the pineapple (check out our slicing tutorial) and banana, first add the ice to the blender, then add the Chula Brand pineapple chunks, the whole strawberries, the yogurt and finally the sliced bannana. The order is important for it to blend easily. Start blending in pulses in order to crush the ice. If your blender gets stuck, stir with a long spoon but be careful not to do this when the blender is on. 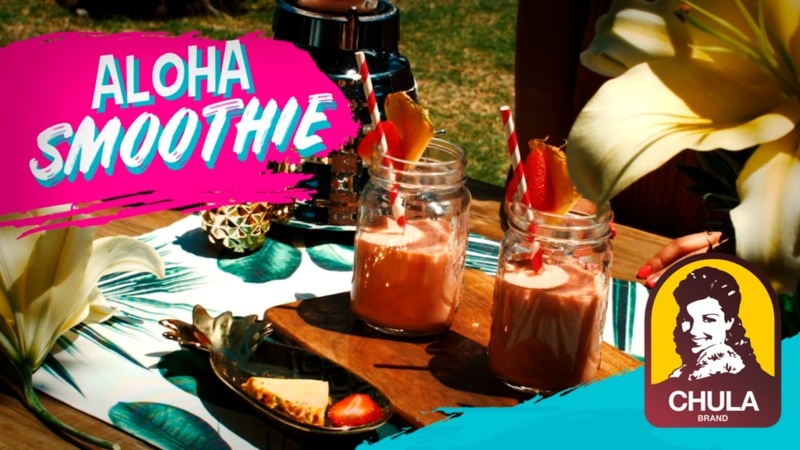 Once you have a nice creamy texture you’re ready to pour and garnish your delicious, fresh and amazing aloha smoothie. Oh yeah!